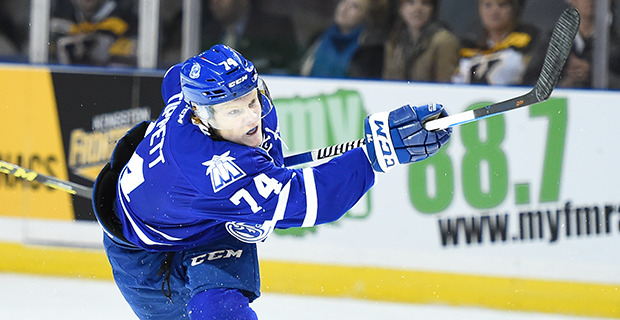 With their #10 draft pick, the Florida Panthers select the “best pure goal scorer in the draft class” (ISS Hockey), RW Owen Tippett of the Mississauga Steelheads. Tippett has a killer wrist shot and is a sniper down the wing. He can score from anywhere. A real competitor who has many above average aspects and skills to his game, Owen Tippett’s most highly rated skill is his ability to shoot the puck. One of the hardest shooters in the draft with a lightning quick release, he doesn’t always the accuracy behind his shot. The puck does not stay on his stick long as he likes to shoot and shoot a lot. Tippett plays effectively in all situations and will see some time on the point on the power play. He has explosive speed and fantastic skating abilities and can really fly down the wing, turning defencemen inside out while maintaining control of the puck. His tremendous acceleration has him at top speed in a few strides. His play away from the puck needs some work but he is due for a breakout sophomore season. DID YOU KNOW? Tippett is the first cousin of Tampa Bay Lightning prospect Mitchell Stephens (formerly of the Saginaw Spirit) who was a second round draft pick (33rd overall) in the 2015 NHL Draft.